St Peter (Simon Peter) was a fisherman probably from Bethsaida, Galilee. He and his brother Andrew became one of Jesus’ twelve Apostles, “fishers of men”. He is extensively referred to throughout the New Testament including two letters attributed to him. St Peter accompanied Jesus on many occasions. He would have listened to Him preach and teach as well as witness many of his miracles. Jesus’ final miracle was to heal the ear of a servant which St Peter cut off in the Garden of Gethsemane. The Feast of St Peter is the 29th of June. O Holy Apostle, because you are the Rock upon which Almighty God has built His church; obtain for me I pray you, lively faith, firm hope and burning love; complete detachment from myself, contempt of the world, patience in adversity, humility in prosperity, recollection in prayer, purity of heart, a right intention in all my works, diligence in fulfilling the duties of my state of life, constancy in my resolutions, resignation to the will of God and perseverance in the grace of God even unto death; that so, by means of your intercession and your glorious merits, I may be worthy to appear before the chief and eternal Shepherd of souls, Jesus Christ, Who with the Father and the Holy Spirit lives and reigns forever. Amen. 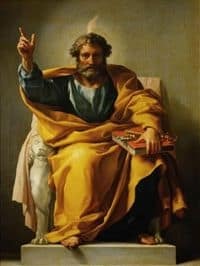 O Holy St Peter, I also seek your intercession on my behalf as I earnestly ask the Risen Jesus for this a special favour… (Share your request) … but may the will of God be done. V: Let us pray for our Pope. upon the earth, and deliver him not to the will of his enemies. Let us Pray: Almighty and everlasting God, have mercy upon your servant, our Sovereign Pontiff, and guide him in your goodness on the way of eternal salvation; so that, with the prompting of your grace, he may desire what pleases you and accomplish it with all his strength. Through Christ Our Lord. Amen. V. Mother of the Church, R. Pray for us. V. St. Peter, R. Pray for us.